Developing News – Developing News Intended To Develop YOU! Developing News Intended To Develop YOU! All the gospel narratives relate that before his death, Jesus underwent a sort of anticipatory grief. They tell us that in the Garden of Gethsemane he prayed that, if it were possible, the “hour” might pass from him; he knew what lay ahead. A deep melancholy seems to have filled the soul of Jesus in the hours preceding his death; a terrible anguish weighed upon him but, it is written, obedience to the Divine will sustained him. This scriptural account of Jesus ’ anticipatory grief came to my mind recently—a gift really— and provided insight and consolation to something I have been experiencing. A sadness and anxiety has been enveloping my days and, once aware of it, I sought to identify the source, the cause of the disquiet. Why am I often on the precipice of tears and, though lonely, find solitude so desirous? I realize that I too, know what lies ahead; I have been anticipating the inexplicable grief I experienced in 2011, at that “hour” on August 5, when I received the telephone call from a police officer informing me that my daughter had been killed in a terrible car accident. In these weeks leading to August 5th, 2017, I have, by no conscious intention of my own, been returning, emotionally and mentally, to the same weeks in 2011, recalling how those days were spent; the conversations I had with my daughter, the lunches we shared, the plans we made, the purse she borrowed for her trip. Though the memories are bittersweet they in some way enable me to be with her again for she was alive at this time in 2011. The memories do bring regrets, some “would’ve, could’ve, should’ve’s”, but gratitude always wins the day. I’ve never been angry with God; how could I be; the accident was not His fault nor His doing. I was grateful to Him when she was born—that she was born—and that gratitude never wavered while she was alive. And I believe she still is —just not where I can see her. I do long for my daughter and always will. A mother and child who share a heartbeat are forever linked even when only one is still beating. This is what makes the loss so intense and would probably lead to despair if not matched by an equal intensity of faith. I will always be grateful to have had Madelen even if it was for a little while. While anticipatory grief often relates to those caring for someone who is dying or to the person facing death, anticipatory grief also finds resonance with us who face the anniversary of the death of a loved one. The days of and between August 5 and August 10, the day of Madelen’s death and of her funeral, our final time together on earth, are dark days. In 2011 they were dark because it was a period of profound grief and disbelief in the events unfolding; since then they remain dark for it is a period of remembering, reliving, regretting—and longing; dark also because of the temptation to despair, to question, to doubt, and the consequent struggle to resist. I know that without Easter there would be nothing good about Good Friday. That is, I know death does not have the last word. And because I believe I am sustained – as Jesus was in the Garden of Gethsemane. Perhaps we should not seek recognition but we all need affirmation. Our heart pumps about 100,000 times a day to keep life giving blood flowing through us. Because of this the heart is often considered representative of our very selves. We say, “I put my heart into it” or “I want that with all my heart” or “I sang my heart out!” The biblical reference to the heart implies the depth of our selves, that inner and vital place where we decide, among other things, for or against God. The heart is also a symbol for love. God, who speaks to us using our own experiences and ordinary and familiar things, uses the human heart as the symbol to represent Jesus’ life-giving love. The heart of Jesus was a human heart like ours. It stopped beating the day he was crucified. According to the Gospel of John, after Jesus died a soldier made sure of his death by piercing his side with a lance. Blood and water poured out (John 19:34). Jesus had said that out of his heart would flow rivers of living water (John 7:38). The water from the side of Christ on the cross was the water of salvation. Jesus’ pierced heart became a symbol of the completeness of his love for us, a love that enabled him to die for us; to not only give up his life but give his life to us, to remain with us. The heart of Jesus, human and divine, is the symbol of his total self-giving and life-giving love. In art the Sacred Heart is pierced, surmounted by a cross, and encircled with thorns. Light radiates from it to show that it is a burning furnace of love—a love that will not be quenched. The Sacred Heart of Jesus artfully summarizes the paschal mystery—his passion, death and resurrection which was fueled by divine love. Devotion to the Sacred Heart began in the twelfth century. Saints such as Bonaventure, Gertrude, Catherine of Siena, and John Eudes were attracted to the Sacred Heart. It was St. Margaret Mary Alacoque, a sister in France, who promoted devotion to the Sacred Heart of Jesus with the support of St. Claude de la Colombiere. Margaret Mary had visions of the Sacred Heart from 1673 to 1675. In one of the visions, occurring within the octave of the Feast of Corpus Christi (Body and Blood Christ), Christ showed her his wounded heart. He said, “Behold this heart burning with so great a love for man.” In 1856 a feast in honor of the Sacred Heart was declared for the universal Church to be observed on the Friday after Corpus Christi and later, in 1899, Pope Leo XIII consecrated the world to the Sacred Heart of Jesus. Devotion to the Sacred Heart focuses not only on the love and mercy Jesus has for us but on reparation for sin. In St. Margaret Mary’s visions Christ requested that a Communion of reparation be made on the first Friday of every month. Today, there are many organizations who further the devotion to the Sacred Heart of Jesus; together we pray that our hearts may become like his—self-giving; life-giving. The month of July finds me busy creating and developing opportunities for Adults to gather together to be formed and informed throughout the rest of this year and into the next. One of these wonderful opportunities will be a lecture by Professor Danny Praet from the University of Ghent in Belgium. Professor Praet will be in the States attending a Conference but has carved out time to be at Saint John’s to speak on one of his areas of interest and expertise—the famed Ghent Altarpiece. The Cathedral in Ghent abounds with stunning religious art, but the one artwork which stands out among the rest is The Ghent Altarpiece by Jan van Eyck. It has been known by various names since its creation. In Flemish, the altarpiece is known as Het Lam Gods, “The Lamb of God.” It has also been referred to as The Mystic Lamb, or simply, The Lamb. The Ghent Altarpiece, the young van Eyck’s first major public work, was also the first large-scale oil painting to gain international renown. Though he did not invent oil painting, van Eyck was the first artist to exploit its true capabilities. The artistry, realistic detail, and new use of this medium made the artwork a point of pilgrimage for artists and intellectuals from the moment the paint dried and for centuries to follow. The Altarpiece is a work of art that legions of collectors, dukes, generals, kings, emperors, and entire armies desired, to such an extent that they killed, stole, and altered the strategic course of war to possess it. In the Second World War, American officers of the Monuments and Fine Arts Division (“Monuments Men”), a group of art historians, architects, and archaeologists, were charged with recovering and protecting art and monuments in war zones. They were given a list of major artworks that had disappeared since the start of the war. The list included masterpieces from museums such as the Louvre and the Uffizi; Davids from France, Botticellis from Italy, and Vermeers from the Netherlands. Their value was incalculable, their destruction irrevocable. At the head of that list was The Ghent Altarpiece. Allies knew of Hitler’s dream to create a super-museum and of the scores of secret Nazi art depots in castles, monasteries and mines throughout Nazi-occupied territory.The biggest cache of all was in an abandoned salt mine in the Austrian Alps, in a place called Alt Aussee. It had been converted into a high-tech underground storehouse for all of the looted art destined for the super-museum in Linz. The stolen collection numbered over 12,000 works, including masterpieces by Michaelangelo, Raphael, Vermeer, Durer, Rembrandt, and Leonardo. But the work the Nazis prized above all was van Eyck’s,Ghent Altarpiece. Jan van Eyck painted The Mystic Lamb between 1426 and 1432, a tumultuous time in European history. Among the notable events of this period were England’s King Henry V’s marriage to Catherine of France; two years later, Henry died. Joan of Arc was executed in the midst of the raging Hundred Years’ War; Brunelleschi began to build the dome of the Cathedral in Florence, Santa Maria del Fiore. In considering how to situate The Ghent Altarpiece in the history of art, it is said alternatively that it is the last artwork of the Middle Ages or the first painting of the Renaissance period. It is considered as the last artwork of the Middle Ages because the form of the frame, the painted architecture, and the figures are Gothic in style. The extensive gilding, an effect added later by a gilder after the artist had completed his work, is also a Gothic characteristic. And yet, one can easily argue that the masterpiece represents the first paining of the Renaissance period for though there is gilding, the work also abounds with naturalistic landscapes and backgrounds, characteristic of post medieval painting. Its realism, unprecedented in the Middle Ages, can also be said to have been inspired by a Humanist ideology. But rather than relegating The Ghent Altarpiece to the Middle Ages or the Renaissance, the painting can be viewed more accurately as the fulcrum between the Middle Ages and the Renaissance, in art as well as thought. What is the painting of? This seemingly simple question has a complex answer. Most religious paintings of the fifteenth century were inspired by, or precisely illustrated, a particular passage in the Bible. The Ghent Altarpiece refers to many biblical and mystical texts, but is a synthesis rather than a precise illustration of any one of them. One must excavate the various layers of theological references and iconography before linking together the individual pieces into a constellation. In the time before the printing press, one of the great pleasures of an educated life was to contemplate drawings, paintings and portraits over the span of hours, months or even years. They were sources of intellectual and aesthetic pleasure, something to be debated with friends. These pieces of art would often include varying levels of complexity and in depictions of biblical scenes, could still be easily identifiable by the simple admirer but, also containing erudite images, appealed to the educated and sophisticated viewer by conveying a hybrid of various theological texts, references to mythology or pagan ideas, and time-and-place specific occurrences. These ideas might be obvious to the contemporary viewer but would be foreign to later audiences. To be sure, the images in The Ghent Altarpiece are varied, theoretically and theologically diverse. The painting both enchants the eye and provokes the mind. The pleasure in deciphering the masterpiece will be ours as we are led into the work by Professor Praet. He proposes a new interpretation of its structure and philosophical-theological meaning by connecting the panels of the lower register with the four cardinal virtues of Antiquity (prudence, justice, temperance and fortitude) and the three theological virtues of Medieval Christianity (faith, hope and charity); no monumental task for a monumental scholar! For more on the story of the most desired and victimized art object of all time see, “Stealing The Mystic Lamb”, by Noah Charney. For information on Professor Praet’s lecture at Saint John Vianney Catholic Church go to http://www.stjohnvianney.org. It is a special liturgy, this Sunday, known as “Palm Sunday of the Passion of the Lord.” If you were tempted to think of it as just another Mass but with a few additions, prepare to drop that assumption. Passion Sunday is a very deep vision into the heart and soul of Christianity. The procession with Palms precedes the Mass. Before the procession we hear a Gospel reading which states the premise: Jesus is kingly and making a triumphal entrance into Jerusalem. People cheer wildly and the whole city is stirred to its depths. They layer his pathway with palm branches and even sprawl out their coats upon it. He must not be sullied by the common roadway. The Mass begins with the first reading from the passage from Isaiah called “The Third Song of the Suffering Servant,” one that Jesus knew well. “The Lord God has given me a well-trained tongue,” it says, “that I might know how to speak to the weary a word that will rouse them.” This he did and was applauded for it, even treated like a king. So far; so good. But then things get interesting. “I have not rebelled, have not turned away. I gave my back to those who beat me…” Jesus allowed his own body to receive brutal scourging. Like the Suffering Servant, Jesus “set his face like flint” toward the humiliation that was to come. So the kingship of Jesus meant terrible suffering and humiliation, not simply publicity and grandeur. The second reading has the words to a Christian hymn which Paul quoted, bringing out the same contrast. On the one hand Jesus had every right to be known as the greatest human being ever born (in the desert temptation Satan had tempted him to think this way) but on the other he “emptied himself, taking the form of a servant.” “He humbled himself and became obedient unto death.” Is this what it means to be king? The next verse of this ancient hymn says that God did exalt Jesus but God did not take away the passion or relieve him of the cup he was to drink. God showed that the greatness of kingship consists of love that is willing to sacrifice for others. Palm Sunday of the Passion of our Lord is about this contrast; kingship of splendor and fame versus kingship of service to others. The two Gospel readings present this vision. All this is brought to a head in the gospel story of Jesus’ passion and death. What better way to show us what God’s kingship is really about. So, at last, Jesus was doing it – the thing he had preached about. Give yourself for others. Now he was demonstrating real kingship. But that line doesn’t refer to some ominous, dark sign at the moment of the crucifixion, meant to stun the world and prove it made a gross mistake. It refers to something else, not dark and fateful at all. The sanctuary veil was the curtain that hung between the people and the holy of holies, the most sacred of all places in the temple, and prevented them from seeing what was behind the veil. What the gospel writers are saying is that, at the moment of Jesus’ death, the veil which separated us from God was ripped open so that now we can approach God, he has been made accessible. Nothing separates us from God. The cross, then, is the ultimate icon, the real depiction of the Holy. It shows us God’s heart, the inner life of the Trinity. On the cross, there is not just one person, Jesus. Ultimately all three persons in the Trinity are on the cross. On the surface we see Jesus, the Son. He is suffering and dying. He hangs on the cross in anguish, dying, alone, humiliated, misunderstood but he also hangs there in trust and fidelity, giving his life away without resentment, recrimination, or bitter questioning, because he knows and trusts deeply enough to, literally, believe in the sun even when it isn’t shining, to believe in love even when he isn’t experiencing it, and believe in God when God seems silent. We see Jesus on the cross but transforming hatred into love, curses into blessing, bitterness into graciousness, recrimination into understanding and God’s apparent silence into faith. Less visible but clearly there, present as the one about whom this drama is ultimately about, is the Father. He is also on the cross, suffering with the Son, holding the Son in this darkness, showing himself worthy of trust waiting to give his response – the resurrection – which is not an act of vengeance, nor a bullying definition of who’s in charge but an act of unfathomable redemption, understanding, forgiveness and love; an act that, more than anything else, defines God. Finally, the Holy Spirit is also on the cross, uniquely generated and released by what unfolds there. As the drama of the crucifixion, the deep interplay of giving and receiving in love and trust, is taking place, a forgiving warmth, a healing fire, and unfathomable patience and understanding are being produced, revealed and released. This energy, the ultimate oxygen, which the gospels depict as spilling out of Jesus’ pierced side as blood and water, is the Holy Spirit revealing the overflowing love between the Father and the Son. Inside God, as we can see from the cross, there is no bitterness, vengeance, loss of patience, or lack of graciousness. When the veil inside the temple is torn, when the side of Jesus is pierced, what we see, what flows out, is forgiveness, patience, gentleness, understanding and warm invitation. The cross, as an icon of this kind of love, defines God as love and gives us a picture of what that kind of love looks like and that which we are called to imitate. This past summer parishioner Michael Haynes left behind the comforts of home to undertake a 400 mile excursion along the Camino Frances, one of the paths that lead to the tomb of St. James the Greater in Santiago de Compostela, Spain. Pilgrimages have been undertaken since the earliest days of the Church, begun by those who wished to see the places where Jesus lived and taught. As the history of the Church continued pilgrims journeyed to venerate the relics of great saints and the sites of Marian apparitions around the world. One of the longest standing pilgrimage routes, the Camino de Santiago, has been travelled by pilgrims since the 12th century to reach the relics of St. James the Greater which lie in rest in the Cathedral Basilica of Santiago de Compostela in northwestern Spain. St. James and his brother, St. John the Evangelist, were the sons of Zebedee and Salome. James is called “the Greater” to distinguish him from the other apostle of the same name who was bishop of Jerusalem and surnamed “the Less” because he was shorter in stature and younger than James “the Great.” It is believed that James was born 12 years before Christ and was many years older than his brother, John. The Gospels record that James and John were fishermen and together they were called by Jesus to follow him. We also know from the Gospels that Jesus nicknamed James and John, boanerges, “the sons of thunder,” perhaps justified by the story in Luke, 9:51-56, which recounts that they wished to call down fire from heaven to destroy a village that had refused them hospitality. James and John were present at the healing of Peter’s mother-in-law (Mark 1: 29) and at the raising of Jairus’s daughter (Mark 5:37; Luke 8:51). They are described in conversation with Jesus on the Mount of Olives (Mark13:3) and were also present at the Transfiguration (Matthew 17:1) and again, called apart from the others, to be with Jesus in the Garden of Gethsemane (Mark 14:33). Their mother, Salome, asked Jesus to accord her sons, James and John, places on his right and his left when he came into his kingdom (Matthew 20: 20-28; Mark 10: 35-45). The sons of Zebedee are specifically mentioned as present at one of the post-resurrection appearances on the lakeshore of Tiberias (John 21:1-2) and were among those gathered in the upper room after the ascension (Acts 1:13). The only certain fact recorded of James after these events is his martyrdom reported in Acts:12:1-3 at the hands of Herod Agrippa in 41/44 AD. Herod, wishing to curry favor with the Jews, condemned James to death for openly proclaiming Jesus as the Christ. When the man who had brought James to the tribunal witnessed the courage with which the Apostle accepted his sentence, he too confessed his belief in Jesus and was beheaded along with James. As they were being hurried to execution, he implored James’ forgiveness. The apostle kissed him, saying, “Peace be with you.” St. James was the first apostle to be martyred. After the ascension of Jesus St. James preached in Judea and Samaria. Soon afterward he set out for Spain and there, won many converts to Christianity. Among these were seven men who were later consecrated as Bishops. St. James returned to Jerusalem at which time he was arrested and beheaded. His body was transported to Iria Flavia in northwest Spain. The site of his tomb was forgotten for some 800 years. On July 25, 812, a hermit named Pelagio (Pelayo) received a vision revealing the tomb of St. James. The location was indicated by a bright light. Because of this, it has since been known as Compostela, which means “Field of Light.” The relics in the rediscovered tomb were authenticated by the bishop of Iria Flavia, Theodomir. Later, in 1095 under Pope Urban II, the see of Iria Flavia was transferred to Santiago de Compostela. In 1884/5, Pope Leo XIII declared in a papal bull that the remains of St. James were indeed at Compostela. 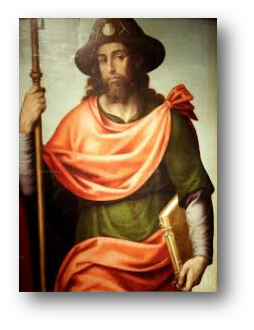 St. James is also known as “Matamoros,” Spanish for killer of the Moors. It is believed that it was through his intercession that Spain was victorious in their fight against the Moors. In the course of the celebrated battle of Clavijo, St. James suddenly appeared on a milk white charger, waving aloft a white standard and led the Christians to victory. For this reason, St. James is often pictured on a white horse holding a white flag. This miraculous vision was granted in response to the soldiers’ invocation of his name, “Sant lago!”, the battle-cry of the day. Hence the name of the ancient city, Santiago. The English name “James” comes from the Italian, “Giacomo,” a variant of “Giacobo” derived from Iacobus (Jacob), in Latin. In French, Jacob is translated “Jacques”. In eastern Spain, Jacobus became “Jacome” or “Jaime:” in Catalunya, it became ”Jaume”; in western Iberia it became “lago” which when prefixed with “Sant” became “Santiago” in Portugal and Galicia. James’ emblem is the scallop shell or cockle shell and pilgrims to his shrine often wore that symbol on their hats or clothes. Relics of saints were believed to possess great power and those of the Apostles were especially venerated: Peter and Paul were known to be buried in Rome; John at Ephesus. In the year 800, James was the most senior member of the intercessory hierarchy whose relics remained undiscovered. However, upon the rediscovery of his tomb, Santiago came to rank with Rome and Jerusalem as one of the great destinations of medieval pilgrimage. The traditional pilgrimage to the grave of the saint, known as The Way of St. James, Camino di Santiago de Compostela, has been the most popular pilgrimage for Western European Catholics from the early Middle Ages onwards. The Camino was proclaimed the first European Cultural Itinerary Route by the Council of Europe in 1987 as well as a UNESCO World Heritage Site. The international pilgrimage route played a fundamental role in facilitating the interchange of cultural developments in Europe during the Middle Ages. Some 1800 buildings along the route, both religious and secular, are of great historic interest. There is no comparable Christian pilgrimage route of such extent and continuity anywhere in Europe. There are at least 12 paths through France, Spain and Portugal. Of these, 5 lead to Santiago de Compostela, Spain. The Camino Frances, “the French Way”, is the most popular of all the Camino routes to Santiago de Compostela in northwest Spain. The Camino Frances begins in St. Jean Pied de Port on the French side of the Pyrennes and finishes about 780 km later in Santiago. During most years more than 100,000 people walk this particular Camino. The route is very well supported by the government. There are many pilgrim-only hostels along the way. These hostels or albergues are mostly staffed by volunteers who wish to give something back to the Camino. Pilgrimages have been an essential part of the spiritual quest since time immemorial. But why do people go on pilgrimages, enduring hardships and discomfort? To be sure, many embark on a pilgrimage for religious reasons, others for the physical challenge. Of the former Pope Emeritus Benedict XVI says, “different from a wanderer whose steps have no established final destination, a pilgrim always has a destination, even if at times he is not explicitly aware of it. And this destination is none other than the encounter with God through Christ in whom all our aspirations find their response.” Pilgrimages to shrines and other holy places recall that our entire lives on earth are a pilgrimage to reach heaven. By taking a pilgrimage we recognize that the ultimate goal of our life is union with God, thus our entire life is prayer in action. The feast day of St. James is celebrated on July 25. When I was fourteen years old I was blessed to go on my first whirlwind tour of Europe. Of all the many fascinating countries, cities and villages we visited, the most captivating was Assisi, Italy. It is a beautiful small town on the top of a hill that is at once serene and exhilarating. Having attended Catholic school for elementary and high school, I was familiar with St. Francis of Assisi and on my initial visit, and every one since, I could not help but imagine St. Francis walking through the narrow cobblestone streets. Almost everything to be seen in Assisi is in some way associated with the memory of the saint. Assisi is truly a city on a hill which cannot be hidden because of St. Francis, his goodness, faithfulness and universal appeal. Inspired by his life, I adopted St. Francis as my patron saint after my first visit to Assisi. Today, I count among my treasured possessions, a faded print of St. Francis which belonged to my beloved grandmother, a plaster statue of Francis that my best friend gave me when I was fifteen years old and a resin statue of St. Francis which stood in my now deceased father’s garden. Each of them are worn, tattered and inexpensive but priceless to me. To be sure, there is irony in the fact that I treasure these possessions which remind me of a saint who denounced possessions. And, I might as well admit that my computer screen-saver is a photo of Assisi which I snapped from an apartment window a few years ago and, my favorite place to vacation in the U.S. is Santa Fe, New Mexico! No saint on the roster of Rome has as many admirers outside the circles of orthodoxy as the saint who went his way singing and preaching not in the official tongue of the Church but in the language of the people. 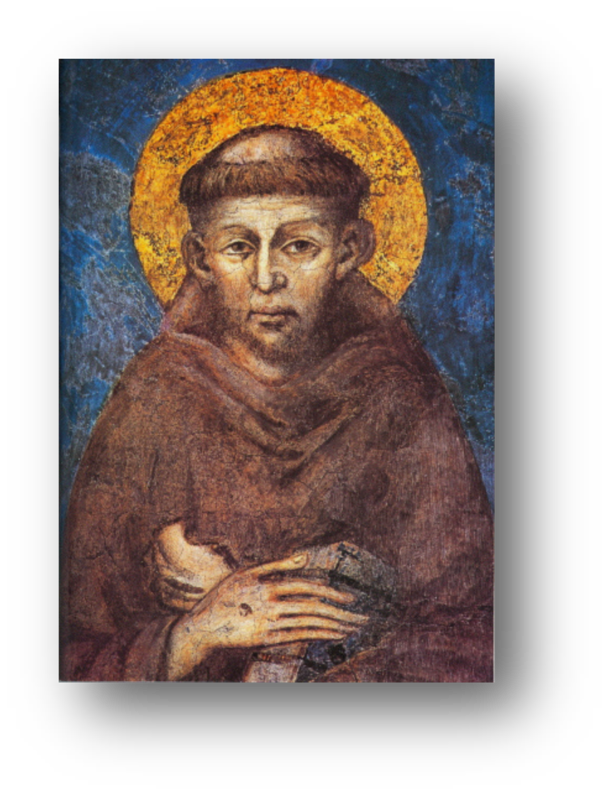 By writers of every nation, representing varieties of religious belief, the “husband” of Lady Poverty, St. Francis has been proclaimed as an apostle of humanity. To elaborate on why I and so many people derive such inspiration from Giovanni Bernardone, the man who became Francis, I borrow the words of Roy M. Gasnick, O.F. M. (Order of the Friars Minor ; the Franciscans). At a time when the Church had over identified with the state, when bishops, abbots and even popes, were more civil authorities than religious leaders, when Christians accepted feudal civilities and authority structures instead of the Gospel as the norm for religion, Francis of Assisi was touched by God to rebuild his Church; to be a witness to the truth and value of the Gospel itself. Though Francis was a witness to the whole of the Gospel, he tended to emphasize those aspects of it that had been least understood or least practiced in his time. God, for Francis, was no stern monarch to be obeyed in fear because he was continually counting up the number of transgressions against his laws. Rather, God was someone personally close, a Father wanting to see his sons and daughters succeed, offering his very own life as assistance but leaving it up to each to accept or reject. There can be no doubt of Francis’ love affair with Christ. It was not the Christ of so many of the late medieval paintings—the judge at the last judgment. It was the Christ of Bethlehem who became a man because he loved man, and the Christ of Calvary, who died as a sacrifice so that man would be raised up from his own inhumanity. When one is overwhelmed at discovering that he has such a Father and such a Brother, no other response is possible except total conversion, a conversion that is more like a love affair—giving oneself totally to God—than a mournful rejection of one’s former life. So it was with Francis. His conversion, his penance, were things of great joy, for he had found a bride greater than any other, a bride who gave him every fulfillment, a bride who would never abandon him. After such a conversion, Francis could no longer live the minimum obligations of a Christian. He went beyond the law, he assimilated the Christ-life in himself. Francis looked around him. Almost all of Europe had been Christianized but Christians had become apathetic. Missionary work—the challenge given by Christ to his apostles to preach the Gospel to all nations—was all but dead. Francis founded a new order in the Church, an order of apostles whom he sent out two by two as Christ had done, to shake up apathetic Europe. In naming his small band of followers, the Order of Little Brothers, Francis considered “little” as a repudiation of the drive for power, prestige, and status. It connoted a desire to become like God’s poor, helpless and defenseless ones; the ones Christ said were blessed, for theirs is the kingdom of heaven. “Little” inferred a desire to serve and not be served, a desire to be available, to help, to be concerned, share with, suffer and rejoice with. Wealth, affluence, engrossment with personal property and material goods—these were seen by Francis as deterrents to brotherhood and union with God. Those whose lives are dominated by money and what money can buy are more concerned with things than with people and can lead to the dehumanization of the individual. Francis’s poverty was intended to witness to this conviction. The world has changed many times over since Francis’s time and yet, many of the same conditions and problems have returned in our time. Millions of words have been spilled out recommending how to solve these problems, how to change conditions, how to shake up the apathetic. So many of the words are clichés that fail to arouse; so many of those who speak cannot be heard because of the contradicting noise of what they do. When Christ says, “You too are to be my witnesses,” perhaps he is saying that the only truth people of our time will know is the believer, individually and collectively, the ones concerned about others, those who are loving, peaceful and faithful. To say it another way, We may be the only Gospel our neighbor will ever read.